Looking for your furniture to make a statement? The Amish Modern Curve Swivel Barstool is ready for action. This incredible barstool is built in Amish country in Ohio. Great care and skill is devoted to each and every barstool the Amish build. Waves run throughout this wood stool, and they look so perfect it's hard to believe they are made out of wood. Stool legs wave from top to bottom, while the stool back has a wavy central splat flanked by two slender ones. 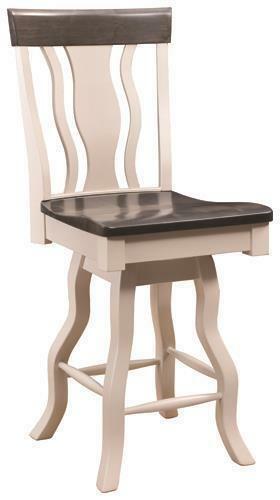 The Modern Curve Swivel Barstool is part of the Hillview Chair Collection that's proudly made by the Amish in Ohio. Every detail is carefully considered, and your new barstools go through numerous inspections to be sure they are the best. Each stool is made by hand and is built to be strong, durable and beautiful. Enjoy knowing you are bringing home barstools that are going to last. We'd love to hear from you. If you'd like to work with an Amish Furniture Specialist, please email or call us. We are happy to offer a 30% down payment plan. Shown in Brown Maple with Mindful Gray with OCS-119 on Seat & Top Back.